The Type 14S Servo Flex Press is designed for fully automated operation with a convenient, ergonomic 10" touch screen PanelView interface. The compact, all stainless unit has servos located outside the frame for easy maintenance accessibility. Since the press has no hydraulics, there is no water cooling required, which reduces operating costs and sanitation concerns. The Flex Press can handle 12-16 bellies per minute. Maximum die chamber size is 40 x 16 x 4.7" (1016 x 406 mm x 120 mm), with a height variation up to0.75" (19 mm). 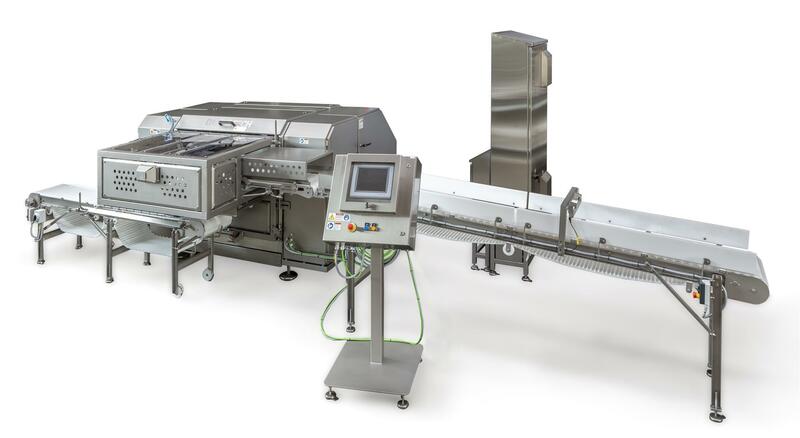 The unit presses frozen meat from 4 directions to maximize yield. Pressed product yields a higher percentage of #1 slices when the frozen meat is sliced. Feed conveyors load and discharge frozen bellies, with custom lengths available to integrate with existing production lines. • Flexible chamber to press variable raw material thicknesses and prevent damaged product. • Remote electrical box away from production floor to protect from moisture. • 10" PanelView touch screen controls with visual troubleshooting assistance. • Change diesets in 5 minute without tools.